When arriving at the gates please have your ticket out ready to be scanned. We do not recommend relying on cell reception. Ideally, it is best to have your ticket printed or if you do not have access to a printer then please take a screenshot of your barcode before coming in and have your phone brightness turned up. A taxi rank will be available outside the venue after the show. No bus services are provided for this event. Taxi company suggestions Hawke’s Bay Combined Taxis ph 06 835 7777 or Hastings Taxis ph 06 878 5055. 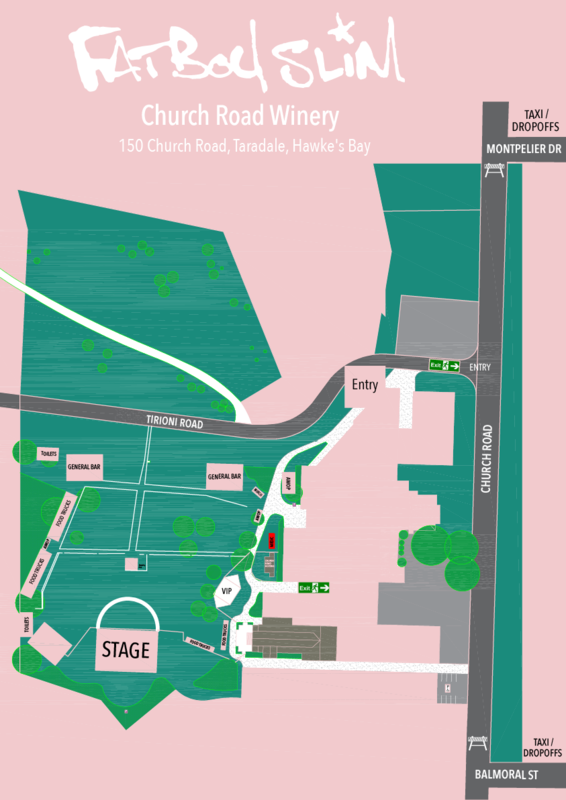 Yes, there will be beverage tents at the concert selling Church Road wine, beer and a selection of non-alcoholic beverages. Proof of identification will be required upon entry into the event. Fatboy Slim Napier is strictly R18. There will also be a number of food stalls serving a wide range of delicious food.